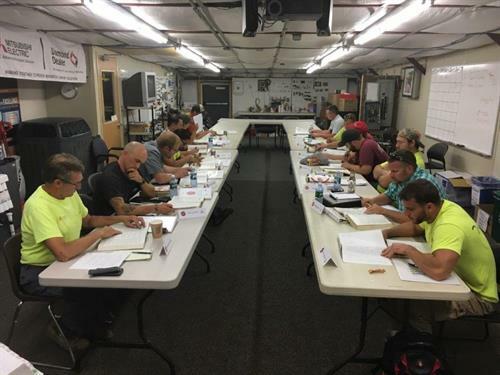 A 12 week course dedicated to preparing experienced individuals to take a Master Electrician licensing exam based on the National Electric Code. About the Instructor: Bruce Seilhammer, SECCO Electrical Construction Services Group Manager, Master Electrician, Harrisburg & Reading licenses, 35+ yrs experience. REQUIREMENTS: 5+ years in the electrical trade, your own copy of 2014 NEC with tabs, and a non-programmable calculator. * Please review the NEC Table of Contents prior to the start of classes. Cost: $750.00** per person, IEC Members; **Discount – 2nd or more attendees from same IEC company = $700.00 per additional person. $900.00 non-member, merit-shop companies. Registrations due by 12/21/18. Class size limited to 20 students. $750.00** per person, IEC Members; **Discount – 2nd or more attendees from same IEC company = $700.00 per additional person. $900.00 non-member, merit-shop companies.